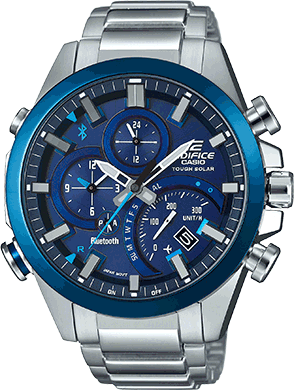 Built with Casio’s original Smart Access Technology, the EQSA500B-1A offers advanced functionality in addition to style and comfort. Smart Access Technology permits easier, more intuitive operation of multiple watch functions by controlling independent hand movement, made possible by a new 5-motor layout, via an electronic crown. For example, the chronograph can record up to 10 lap times at an accuracy of 1/20th second and lap time results can be accessed using the electronic crown’s pull and turn motion. 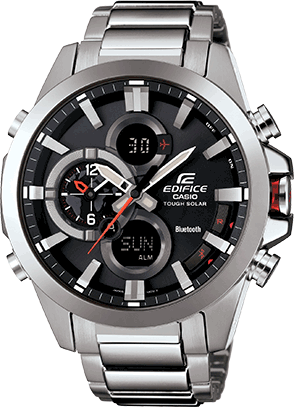 Silver Stainless Steel band chronograph watch with black and red face.